When doing research, it's often necessary to find income by Census tract data especially if you are tasked to identify low income Census tracts. A Census tract is a division of a county, much like a zip code. Tracts tend to have between 2,500 and 8,000 people. It's fairly easy to identify which county or city a project is in, but it can be more frustrating to identify the Census tracts that are in a project area. There are two different ways that you can get income by Census tract data. One way to get income by Census tract data is to use the US Census' website. You can identify the Census tracts that you're interested in using the Census' tract by county maps. Once you get the Census tract numbers from the maps, you can then plug those numbers into the Census' FactFinder2 tool. Once in the FactFinder2, you'll have a variety of income tables to select from (i.e. median household income, income breakdown, etc.). 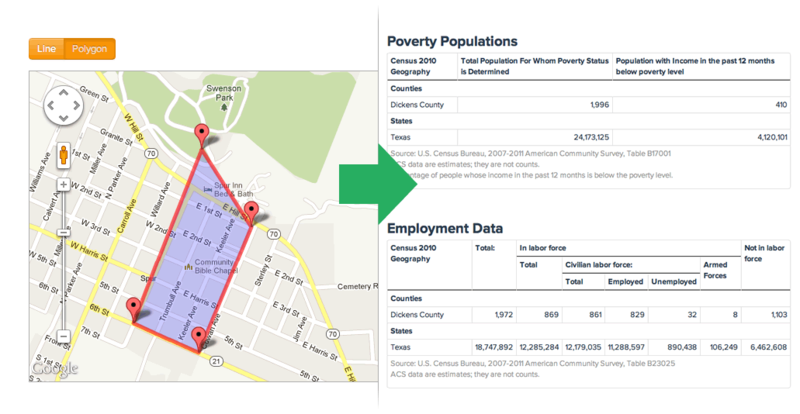 Pick income tables that best fix your needs, and then you can get reports with income data for Census tracts in your project area. We have a web tool that you can use to get income data by Census tract. The tool works by you drawing your project or area of interest on an online map. Then you'll get demographic data reports - including median household income as well as income data distribution - for the Census tracts in your area of interest. The web tool prices start at $20 a month. Learn more about Cubit's web tool. No matter what U.S. Census Bureau data you need, Cubit gets it and delivers it straight to your inbox - fast. Nothing could be easier. That's why over 1000 people and companies use Cubit to get custom demographic data effortlessly. Our customers say that getting their questions answered by real people is the best part of working with Cubit. I'm Kristen and I'll be pulling the custom data you desire, and answering any questions you may have. I've worked with demographic data as a Research Associate in economic consulting, a Socio-Economist in environmental engineering, and now as a Co-founder of Cubit, a small company that has helped thousands of people get demographic data fast. If you have any questions about data or our services, call me at 1-800-939-2130.